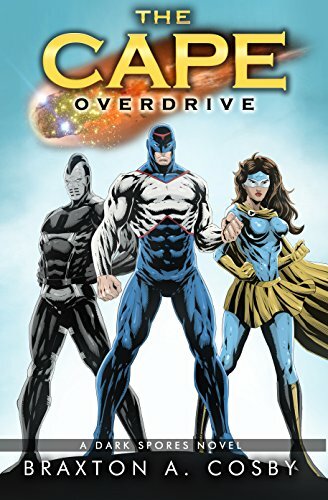 The Cape: Overdrive is an excellent addition to the Dark Spores series. Sebastian continues to use his wealth to create suits that turn him into a Super-Normal and his alter ego, Paladin, in order to protect the streets of Chicago, that in recent years have become a lot crazier. After many Normals were changed into Super-Normals, the dynamic of the planet has changed; it again turned into a war between differences. A lot deadlier war, a war in which the Super-Normals had to choose a side, a side between humanity or evolution of humanity. In this addition to the series, the idea of an alien race starts to set the governments of the world and Super-Normals into a long and dangerous trek into the unknown. The United States of America is trying to recruit Sebastian and his team to save them from a very strange asteroid hurtling towards Earth. As Sebastian and his team try to unravel the mystery surrounding strange artifacts and other Super-Normals, they come up with more questions than answers. Read The Cape: Overdrive to find out how Sebastian tries to overcome his challenges personally, physically, and mentally. This addition to the series makes sense; in a world full of Super-Normals it only seems, well, normal that there should be aliens involved. I enjoyed that this book showed how the Super-Normals were still human and that in a world full of them they would have to choose between humanity and their newfound abilities. The interaction of characters and the tension between them was natural and beautiful. The story was wondrously crafted to leave you on the edge of your seat; I tried to put the book down to accomplish another task but was quickly drawn back to finish it. As the book came to a close, I was left with more questions than answers and wanting to know more. I look forward to the next addition to the series. I see this book as an enjoyable cross between Star Trek and the TV series The Flash, with characters just as well-crafted and relatable. I was left with a feeling that something like this could happen, yet it is just out of our reach. That is probably the best compliment I can give to a science fiction/fantasy series because that is the point of such books, to take us to infinity and beyond and make us believe that it is an inch away. There were a few uses of colorful language.